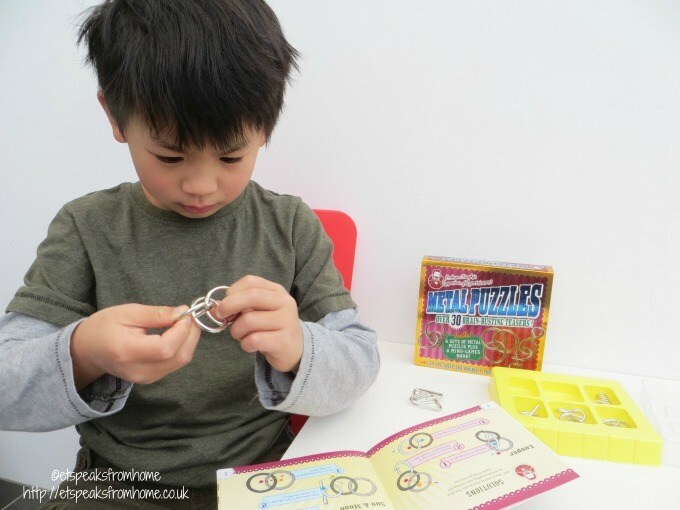 Does your child love brain teasers or puzzles? 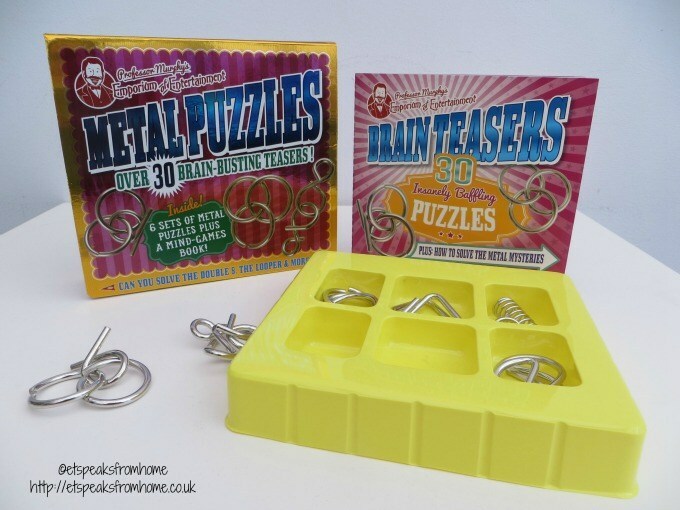 Look no further as we have found this brain-busting metal puzzles box from Professor Murphy! This is not our first time reviewing Professor Murphy products as we had reviewed the Stunt Glider kit before and loved the concept. This metal puzzle is suitable for ages six and above. It is out now and available to buy from Amazon. Inside this box, it comes with six sets of metal puzzles (looper, trigon, sun & moon, big bang, helix and double 8) plus a 16 page mind-games book. Inside the book, it shows you the step-by-step to solve the puzzles. They are very easy to follow and includes helpful pictures. Mr K was able to solve a few metal puzzles very quickly and the rest is still a work in progress. He has not referred to the book yet as he would like to solve it himself. There are also puzzles and riddles in the book; some of the questions were very tricky and hard to solve. Even I was not able to solve some of the questions and found them tricky! The questions are very challenging and definitely keeps our minds thinking! We all had our go at the riddles and Ms C being the youngest was struggling to get it right but she had fun trying to answer it. I would definitely recommend it as it is very affordable and it comes in a nice kit which will keep your child busy for a while! Disclosure: I received this kit from the publisher for free. However, they have not paid me for this review, and they do not exercise any editorial control over my review or anything else on this site. Contains Amazon affiliate link.